Big Print™ is the first printing calculator with the option to function with 12 normal size printed digits or 10 Big Print™ digits. Big Print™ characters are 150% larger than any other calculator. Big Print™ digits are so easy to read that people are finding they don't need their reading glasses when they are making their calculations. Features a 2-color 10/12 digit dot matrix display. 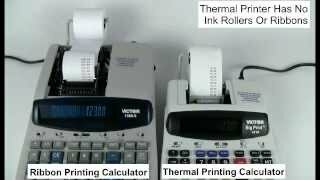 The Big Print™ calculator also features a thermal printer that prints 6.0 lines-per-second and is whisper-quiet, making the Big Print™ easy on both the eyes and ears. Cost/sell/margin keys make for quick and easy profit margin calculations (simply enter two variables and the third automatically appears). 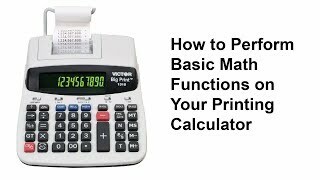 Other functions include: constants in multiplication and division, percentage add-on and discount, time/date, change sign key, large-size add and subtract keys, nonprint or print mode, item count, fully selectable decimal settings, selectable rounding switches and 4 key independent memory. AC Power. 2 year manufacturer's standard warranty. Paper Type Thermal 2 1/4"